I have a whole one puzzle writing colleague, the delightful and kind Greg Parker, otherwise known as The Puzzle Wizard. I've visited him in Brisbane a couple of times now, stayed with his lovely family, and he's been down to Canberra a few times too. It's a real treat to be able to talk shop with him - there's not many I can do that with! We occasionally bounce questions off each other during our working days (such as how to write a good clue for CAPON that avoids having to use the word castrated (which is not acceptable clue vocab)?!). Several years ago I asked him for puzzle writing work, which he couldn't offer me, but he did need a graphic designer! 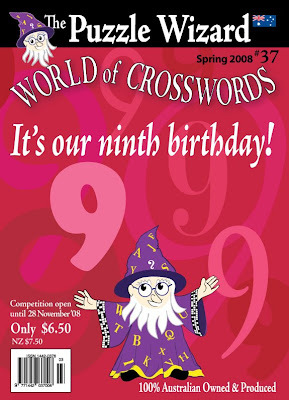 I started designing the covers for his World of Crosswords series with Issue 30, and developed the new Puzzle Wizard character ... I'm hoping to start designing his Crossword Magic covers soon too. And I redesigned his web site earlier this year. This is the only "graphic design work for clients" that I still do. Anyway, I just wanted to show you a cover that I'm really happy with, it was one of those "Damn, I'm running out of time" designs, and is so often the case, it all came together really quickly and effectively! As this is the 9th anniversary edition, there are nine 9s on the cover, and nine 9s on the back! This issue should still be in the newsagents for a while yet. I can highly recommend his series of puzzle books ... quite different from the big publishers' books, with excellent clues. OK, back to work ...! ETA : Yes, I wrote The Canberra Puzzle Book, Junior Canberra Puzzle Book, The Fantastic Flying Doctors' Puzzle Book, Alice Springs School of the Air Puzzle Book, and the Amazing Animals Puzzle Book (for the RSPCA). And yes, it is very cool seeing covers I designed on the shelves! Isn't it great to have someone who understands your shop talk and can talk back? What a good cover. I like the nine 9's motif and the wizard character. You are a multitalented woman. I can't imagine seeing my work on a newsstand like that. Do you get a little shiver? Did you do the Danberra puzzle books? We LOVE them! AWESOME!!! I HAVE A FLYING DOCTORS PUZZLE BOOK!!! I got it when we were in Cairns and went to the museum. All I could remember was the icky Sydney Funnel Web Spider they had preserved there. That and the really cool plane and other stuff of course. Bravo, bravo! What a thrill to see your work on the shelves. Yay for you!! Ha, that's true, I don't imagine you find a lot of puzzle writers walking around. Fascinating what you can learn reading blogs! But onto your your BOOKS. You are amassing quite a library full of titles. As usual, you are prolific and amazing. Did I say inspiring too? Clever clever clever clever - that's you and talented too! I'll look for the wizaed but I don't know if they live on Tasmanian shelves!